Win a new Flat Screen TV! 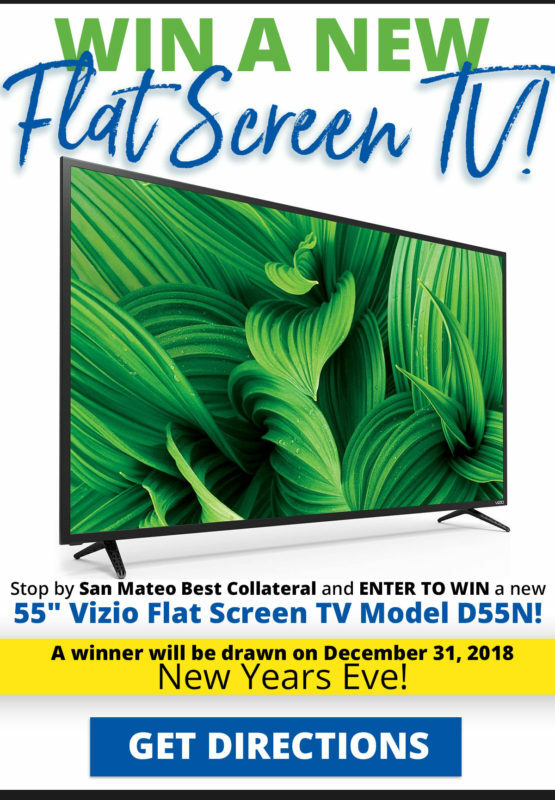 Stop by San Mateo Best Collateral and enter to win a new 55 inch Vizio Flat Screen TV model D55N! Exclusive offer available only at the San Mateo Best Collateral Location. Enter to win in person at the San Mateo Best Collateral location during normal business hours. You must be at least 18 years of age to participate. No purchase necessary. One drawing entry per customer. Winner need not be present for random Winner drawing held December 31, 2018. Click the image for store hours, directions and information. This entry was posted in Latest News, Promotions at BC San Mateo Only. Bookmark the permalink.